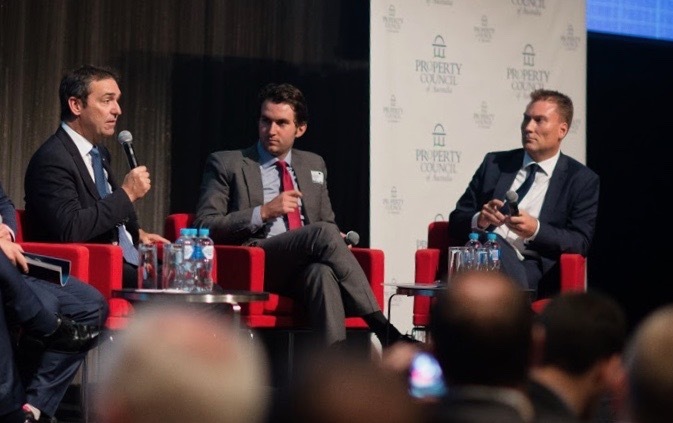 The Australian's Adelaide bureau chief Michael Owen (right) at a Property Council forum with Premier Steven Marshall and The Advertiser's Daniel Wills. The national broadsheet’s Adelaide bureau chief Michael Owen told InDaily he has “accepted a voluntary redundancy and am seeking new opportunities”. It’s understood Owen fell victim to more News Corp belt-tightening, and will depart the Waymouth St office next week. Owen joined The Australian in February 2009 as South Australian political reporter and was appointed bureau chief in November 2011. Owen is known for his combative reporting and lively relationship with the former Labor Government. Big changes @australian confirmed. @mjowen has left. One of the most formidable journalists I have come across, with his own unique style. Owen’s departure leaves The Australian’s Adelaide bureau with a single journalist, Luke Griffiths. News Corp declined to comment to InDaily about the decision. At its peak about a decade ago, the bureau boasted an estimated 10 positions, with a long list of senior journalists being based here. The latest cut reflects ongoing media industry reorganisation as it grapples with digital and social media and revenue earning challenges which have cut a swathe through newsrooms across the country, and globe. The Advertiser shed an estimated 25 editorial jobs last year, on top of a series of cuts to reporting, sub-editing and photographer ranks in the past few years. The ABC has also cut an estimated 50 production, editing, journalist, sound library and other jobs from its Collinswood base since 2015 as it centralised operations in Sydney and focused on digital news. The Media, Entertainment and Arts Alliance estimates more than 2500 journalist jobs have been axed across Australia since 2011. The union told a Senate hearing last year that Fairfax alone had spent up to $500 million on redundancies between 2007 and 2017. Fairfax ceased to exist as a media company last year, when Nine took over its mastheads and radio networks in a $4 billion merger.